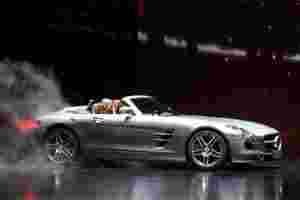 Mumbai: Premium luxury car-maker Mercedes-Benz on Sunday said it will launch its SLS AMG Roadster model at the Auto Expo in New Delhi in January. The company will also display the concept A-Class, which is globally acclaimed for its expressive design and technological marvels, it added. The company’s stall at the Auto Expo will see the presence of more than 10 cars, including the SLS GT3 and the DTM car. Mercedes-Benz, which will launch a driving academy in association with Jaypee Sports International by April, will allow participants at the expo to enroll in the academy. “There will be a lounge area to offer an exclusive experience, special accessory outlets, besides opportunities to offer networking possibilities for patrons and representatives," Honegg said. Mercedes-Benz posted a 31% growth in sales to 6,698 cars during January-November, 2011, from 5,110 units in the corresponding period last year.